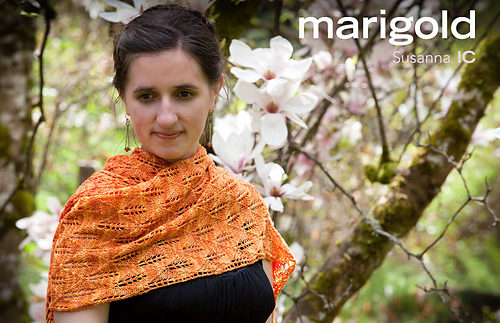 Marigold is inspired by the happy little flower that brightens so many summer gardens. Just like its namesake, this stole features many small petals at the center together with larger leaves along the borders while beads shimmer along the edges much like droplets of the morning dew. The wrap is worked seamlessly from a center temporary cast on down to both ends. 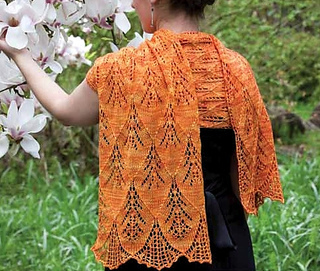 The main body is a simple and quick-to-knit leaf lace, which contrasts nicely with the more elaborate border stitches. Optional beading along the edges makes a pretty addition to the knit and adds extra weight and interest to the finished shawl. If optional beads are used, you will need approximately 250 size 5/0 (4.5 mm) beads and a crochet hook small enough to fit through the hole of the bead. 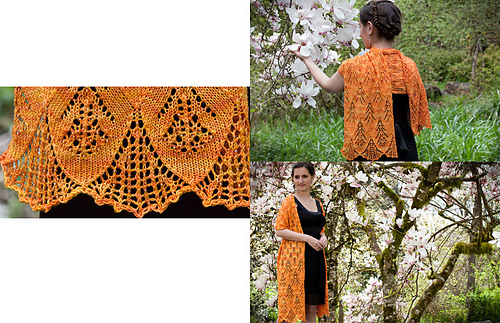 The Marigold pattern is now available as Ravelry download. This pattern was originally published exclusively in The Sock Report, vol 1 in May 2012. Errata for original Sock Report version: Row 107, stitch #8 should read ssk, not a plain knit. Row 125 should have a yarn over on stitch #49 instead of a plain knit.